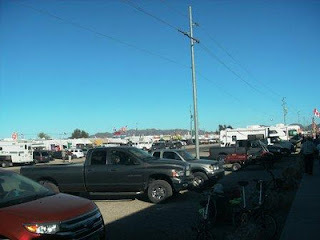 January 19, 2012—Many years ago my sister took me to the Orange County (California) Swap Meet. I had never seen anything like it before—acres upon acres of venders selling all types of things out of tents— luggage, purses (including knock offs of famous brands), dresses, tie-dyed t-shirts, brushes, combs, scarves, belts, boots, shoes, bicycles, tricycles, and baby carriers. And the food! Pizza, tacos, hot dogs, sausage, kettle corn, ice cream, soda…and anything you could think of that could be deep-fried. 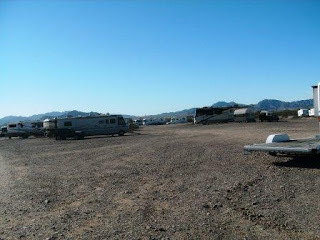 We had heard that Quartzsite in January was something that every RVer needed to experience. We read that there were several shows—a couple rock and mineral shows and a big RV show—during January, and that up to a million RVers congregated and camped on BLM lands surrounding the town. Other than that, we did not know what to expect. The best way to describe Quartzsite is that it is the hugest flea market I’ve ever seen, reminiscent with its makeshift storefronts of the gold-rush mining towns of the old west. Who buys from these venders? People from all over the country—especially those from cold climates. I saw license plates from Utah, Wyoming, Kansas, New Hampshire, and Nevada—and that was just in one block. Since our arrival, we have seen many new arrivals. 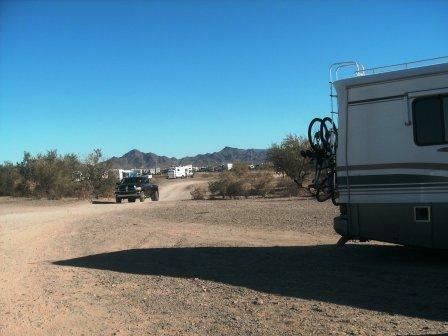 The most popular type of RV seems to be Class A motorhomes, followed by 5th wheels. The neighborhood is growing fast! We’re getting settled in. Tomorrow I’ll tell you about dry camping.